3. 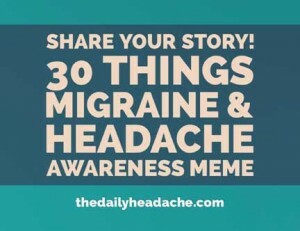 I was diagnosed in:2008, with just having migraines, but have since been diagnosed with chronic problems. 4. My comorbid conditions include: light, sounds, and smell sensitivity, nausea, atm and leg weakness, inability to concentrate/form thoughts, depression. 9. My biggest migraine triggers are: prolonged loud sounds, laughing too hard, not eating, and hydration. Laying in bed too long after I wake up also is a trigger. 10. I know a migraine attack is coming on when: my Hess gets stuffy and my forehead and neck start to get stiff. 11. The most frustrating part about having a migraine attack is: people think I am both overrating my own pain level, and people expect me to continue with work and responsibilities. 12. During a migraine attack, I worry most about: making it work, so I can pay rent. 14. When I tell someone I have migraine, the response is usually: either A: they don’t understand what that really means, or B: they have another possible solution that I’ve already tried. 15. When someone tells me they have migraine, I think:I wonder how much better/worse they have it, because you never really know their pain level compared to yours. 17. My best coping tools are:sites that share others’ experiences and ice packs. Both used at different times. 18. I find comfort in: the dark. 19. I get angry when people say: you’re fine. Do some work instead of just sortisitting there. 20. I like it when people say:Hey, it’s ok, I get it and I’m here to help. 21. Something kind someone can do for me during a migraine attack is: be with me and get me whatever I need..? Like my boyfriend? But others could pick up my shift at work with understanding. 22. The best thing(s) a doctor has ever said to me about migraine is: they haven’t said anything good to me. I’ve had nothing but doctors giving up on my case. 23. The hardest thing to accept about having migraine is: there is no cure. Your best chance is maybe to outgrow it or to have it be less later in life. 24. Migraine has taught me: empathy, and how to step out without being apologetic. 25. The quotation, motto, mantra, or scripture that gets me through an attack is: nothing..
26. If I could go back to the early days of my diagnosis, I would tell myself: enjoy your time when you’re pain free, and rest yourself when you’re in pain. 27. The people who support me most are: my parents, my boyfriend. 28. The thing I most wish people understood about migraine is: it’s not the victims fault.they don’t want to be in pain either. 30. One more thing I’d like to say about life with migraine is:I wish it was gone.